How did the ancient Israelites preserve and pass down God’s revelation to them before they had writing? Writing seems to have appeared in the time line of history around 3,200 BC, but the Jewish calendar starts with the year 3761 BC, so for at least 500 years the Israelites had no reliable way of communicating God’s ‘words’ to later generations. Word of mouth, father to son story telling is the most likely way that knowledge was passed down, but this is susceptible to corruption and personal interpretation. Something more reliable was needed and that ‘something’ was the starry night sky. I explain this concept fully in my book “Revelation in the Stars”, but in short the idea is that the ancients linked their ‘knowledge stories’ to the fixed constellations in the night sky. They did this by identifying the pictures these star configurations suggest and then weaving their stories around these images. The wise men and women of one generation could point to these star pictures and tell the knowledge story associated with it. In this way the divine revelation could be passed down through the generations with little distortion or loss of content. Job 9:9 “He is the Maker of the Bear and Orion, the Pleiades and the constellations of the south’”. Job is most likely the oldest book of the Bible and the references to an astrological connection continue right through to the last book of the Bible. Revelation Chapter Four contains some tantalizing pointers to what later chapters develop more fully. 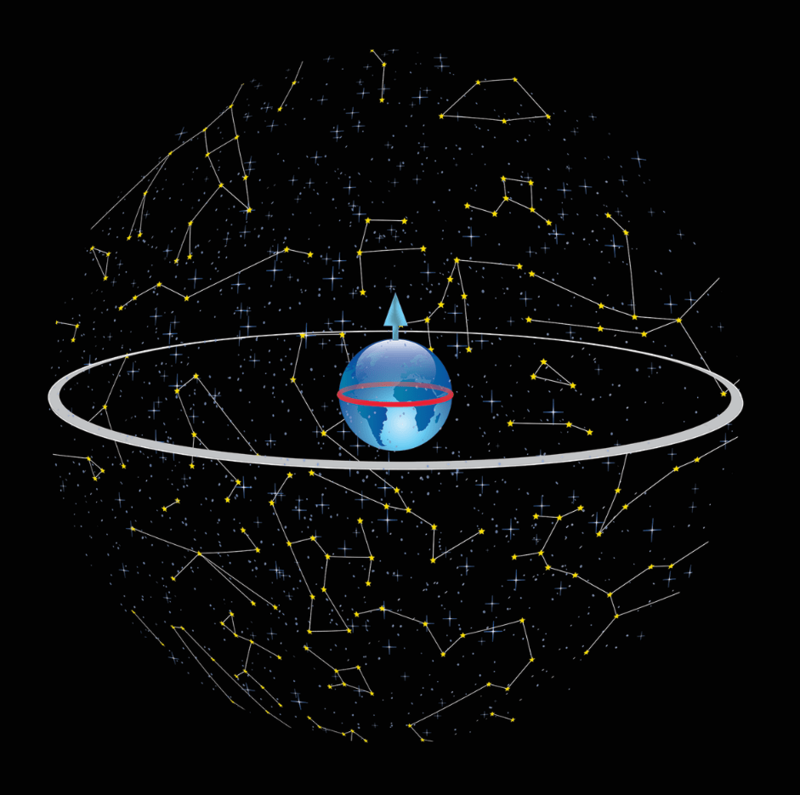 From our vantage point on earth, the stars appear to wheel around the dome of the night sky, and the fulcrum (pivot point) of this rotation is the North Star, also known as the Polar Star. This star marks the apparent ‘center’ of the heavens. Its name is Cynosura, and it lies in the constellation of Ursa Minor, directly under the foot of the constellation Cepheus, the king. Most sky charts show Cepheus as a bearded man seated as if on a throne. He wears a crown and has a royal robe drawn about him. Ursa Minor is shown in modern star charts as a bear with an extraordinarily long tail, but in ancient charts this constellation is pictured as a mountain range. In ancient times God was thought to rule from his throne on The Sacred Mountain (See Isaiah 14:13). Revelation 4 starts with a vision of “a throne in heaven with someone sitting on it”. (Revelation 4:2). Four ‘living creatures’ feature in the vision of the heavenly tabernacle/throne room and they are covered with eyes which in ancient times would signify many stars. These ‘creatures’ could well indicate or be based on the four ‘royal’ stars of ancient times, which were said to rule the four ‘corners’ of the heavens (N, S, E and W). According to most sources, they are Regulus in the constellation of Leo; Antarus in the constellation of Scorpio; Al Debaran in Taurus; and Markab in Pegasus. The coincidence between these stars within their constellations and the description of the four Living Creatures is not perfect, but it is extremely close. The first Living Creature was like a lion, and Regulus is in the constellation of Leo, the lion. The second creature was like an ox, and Al Debaran is in the constellation of Taurus, the bull. The third creature had a face like a man. Antarus is in the constellation of Scorpio, but the ancient Babylonians referred to this constellation as the man-scorpion, and pictured it with the head of a man. The fourth creature was like a flying eagle, and here the coincidence is not as strong because Markab is in Pegasus, commonly pictured as a flying horse; not an eagle but a winged creature nevertheless. So, the first ‘level’ of revelation in Chapter Four is the disclosure of the centrality and supremacy of God. The second reveal is that the Tabernacle of Moses is a simple physical model of spiritual reality and that this model is lifted into another dimension in Revelation Four. The Tabernacle is a model and the description in Revelation is an expanded portrayal, yet reality is so much greater and more mysterious. The third unveiling in Chapter Four is that the book of Revelation is keyed to the ancient verbal truth stories hung on the starry ‘pegs’ of the constellations of the night sky. It is very easy to get lost in the details of this marvelous book, so I strongly recommend that you take a moment to re-read the overview I gave you a while ago. In my next post I am going to open up the wonderful Gospel message of Chapter Five – you will be amazed, once again, at how Jesus shines through the chapters of Revelation with such clarity and glory. Thanks for this article and the free copy of your book! I am very interested in this subject and will surely read your book.